OUR MISSION: Guide and Grow kids to a “deeply-rooted” personal faith in Jesus. Teach them His ways. Empower them to serve the local and global community. OUR VISION: Partner with families, who are the primary spiritual influence in each child’s life. Provide a safe place for children to “grow” and learn about God. of the Education Building, across the Cloister from the Sanctuary. Children may attend Sunday School at either 9:30 or 11:00 a.m. and then attend Worship the other hour with their families. Sunday School begins with a large group assembly time where the lesson for that day is taught. Afterward, children gather in small groups for crafts, games, and activities related to the lesson, as well as prayer. The current curriculum for 1st-5th Graders focuses on the various aspects of worship, such as the Lord’s Prayer, Communion, and the Apostles’ Creed. The goal is to help children know how to participate in worship with a body of believers. We look forward to seeing your child this Sunday. Come at either 9:30 or 11:00 a.m.; either hour will be the best hour of your child’s week! Sunday School for our Preschoolers and Kindergartners occurs in age-based classrooms. Their teachers lead them in Bible stories, songs, and crafts each week that are interactive and age-appropriate. Children in this area of the program have the opportunity to sing in Worship three times each year and also frequently partake of Communion in the Sanctuary as a group. The nursery is located on the lower level of the Education Building. Most of our Nursery Staff and Volunteers have been CPR trained. An alternative to the Nursery is the “Cry Room” adjacent to the Sanctuary. The “Cry Room” allows parents to fully participate in worship while caring for their infants and small children. At BUMC, the safety of children is of primary importance. Our Check-In System ensures that all children are protected in our care. Parents check their children in at the computer station which is located at the bottom of the stairs before class. (Visitor check-in is just inside the front door of the Education Building.) This system prints name tags and security badges. The badge is your “claim check” for your child at the end of class. Only an adult with the tag that has the security code that matches the name badge the student is wearing may pick up the child. VBS is coming June 17-20! It will be from 9 a.m. to noon, Monday through Thursday, with a Family Night Celebration on Friday evening, June 21, at 6:30 p.m. VBS is open to children, ages 4 through rising 6th grade. (Children must be 4 years old by 9/1/19). Join us Sunday, April 28, at 9:30 or 11:00 for our VBS Theme Reveal! Register online today while space is available. Cost is $30 per child. Parents who volunteer each day receive a half-price registration fee for their child(ren). Should you have any questions, please contact Danielle Jennings, Director of Children’s Ministries. Are you looking for an opportunity to volunteer but don’t know where to begin? Our children’s ministry is looking for volunteers who are passionate about sharing the love of Christ to each and every child that joins us on Sundays. 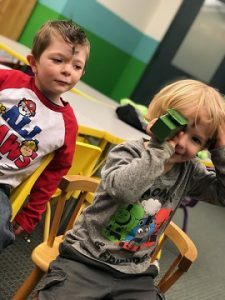 Whether you like to be “front and center” in a classroom, or work behind the scenes; we have the place for you! For more information please contact our Director of Children’s Ministries at danielle.bumc@gmail.com. You are invited to a community of Moms just for you! Exhale is a group for Mothers with children of all ages who want to experience authentic community, mothering support, personal growth and spiritual hope. To Exhale is to breathe out intentionally. Our prayer is for moms to be intentional about making time for themselves and to be intentional about being part of a group that will help them grow in their walk of faith and to grow as women, wives, and mothers. Moms can choose to attend Tuesday mornings, 9:30-11:30 a.m., or Wednesday evenings, 5:30-7:30 p.m. once a month. In addition, Exhale supports UMW events, other community church events, as well as doing socials and missions projects together. Looking for a great return on your investment? 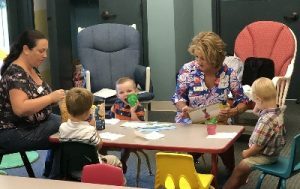 Invest in the lives of the children of BUMC by leading a small group of children in a Sunday School class or just holding a baby in the nursery! Adults are needed to impact the lives of our kids on Sunday mornings at 9:30 and 11:00 a.m. Be a part of the Treehouse and make an investment that will last a lifetime!! Please contact Danielle Jennings, Director of Children’s and Family Ministries, to reserve a spot!